“Outside of bringing to life the pure spectacle of pro hockey in Vegas, the Golden Knights can’t be counted on for a whole lot in 2017-18.” CBS Sports, August 15, 2017. “Wow, the Golden Knights are going to be bad,” the title of a June 22, 2017 article by Deadspin. “At least they have merchandise sales to look forward to!” USA Today, August 2017. The article has since been taken down. Needless to say, the Vegas Golden Knights entered the 2017-2018 season with low expectations. For a team that had yet to build a complete a roster or even play a game, the expectations, while harsh and discouraging to many, had solid historical justification. Expansion teams in the NHL have a rich history of thorough failure. In the inaugural season of the Ottawa Senators in 1992, the team started off its franchise history with 23 straight losses. The inaugural Florida Panthers, the highest scoring expansion team in hockey history, finished last in their division in their first three seasons. In other leagues such as the NBA, NFL, and MLB, expansion teams were unanimously the worst of the worst for many of their early years.’ The inaugural Vegas Golden Knights seemed destined to follow suit, delegated to the bottom of the league. The team was comprised of castoffs-mediocre players considered not good enough to play for any established team, coaches unfit to lead any capable team, and a franchise front office void of experience and expertise. The Golden Knights had all of the ingredients of a bad team. But lo and behold, no one, not even the Knights themselves, could anticipate what would happen next. The Golden Knights began their season on the heels of the 1 October Las Vegas Shooting. A team already facing all odds was now tasked with bringing hope and escape to a grieving city. 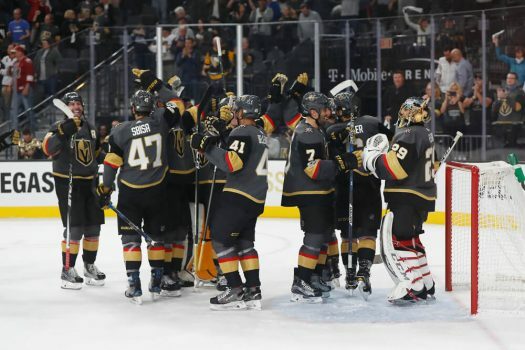 With a daunting road ahead, the Golden Knights powered through and won their first game in franchise history and their home opener. The team transitioned from the laughing-stock of the league to a feel good story in only two games. Their strong run continued. With winning streaks on the road and at home, the Knights showed no signs of the typical new team slump. Now, a few weeks past the midpoint of the NHL season, the Golden Knights are commanding leaders in the league. With 68 points in forty-eight games, the Golden Knights rank first in the Western Conference and second in the NHL, just behind the league-best Tampa Bay Lightning. With the league playoffs slowly approaching, Las Vegans anxiously await the impossible.